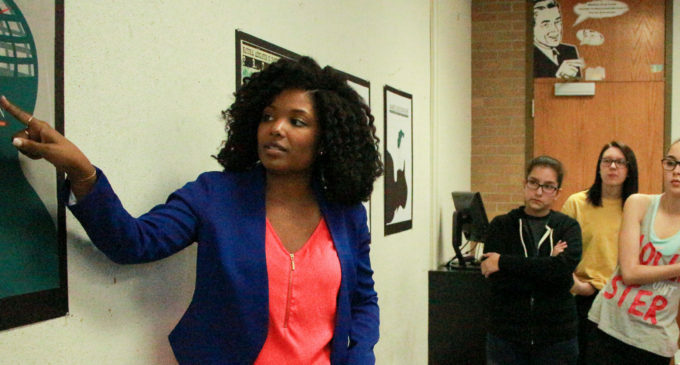 Communication Design Professor, Terressa Hardaway anayzes her students design projects in her class critique, Friday, Feb. 26, 2015. Staff Photographer| Kaylen Howard. Haraway points out little details in a design as students look at the little details. Project Naptural creator Terresa Hardaway, 30, doesn’t need a typical office—she makes do with an isolated adjunct computer lab and a steel gate separating her from a large technology control system. Siting at a table with an open Mountain Dew on one side and her laptop on the other, Hardaway uses her free time to organize her calendar before heading out to teach hour-long communication and fashion design courses as an adjunct professor. “I decided to take my spiritual gifts as inspiration for the way I live my life in the professional world, and sought out a degree to teach at the collegiate level,” Hardaway said. Hardaway created and researched Project Naptural, a natural hair study that has gone global and recently showed at the Union. She is also lead program director of graphic design and art history at Dallas’ Brown Mackie College. Project Naptural is a critical research analysis of women with natural hair. Hardaway said she also used the project to express her knowledge of design and artistic flair. The critical analysis focuses on an ongoing phenomenon in the black community: the way women experience their natural hair. “I was a lucky bystander when she was formulating and conducting her research and was always excited to hear about the progress she made each semester,” graduate student Lisa Mercer said. The graphics in Hardaway’s presentation represent a variety and distinction of diverse black women she critically analyzed and studied. She includes quotes from each subject alongside statistics. Outside of her own research, Hardaway partners with organizations like Natural Hair Work Day, which shares similar ideas on the importance of natural hair in the job industry. Ideas for a new hair line and a Naptural app are underway, she said. 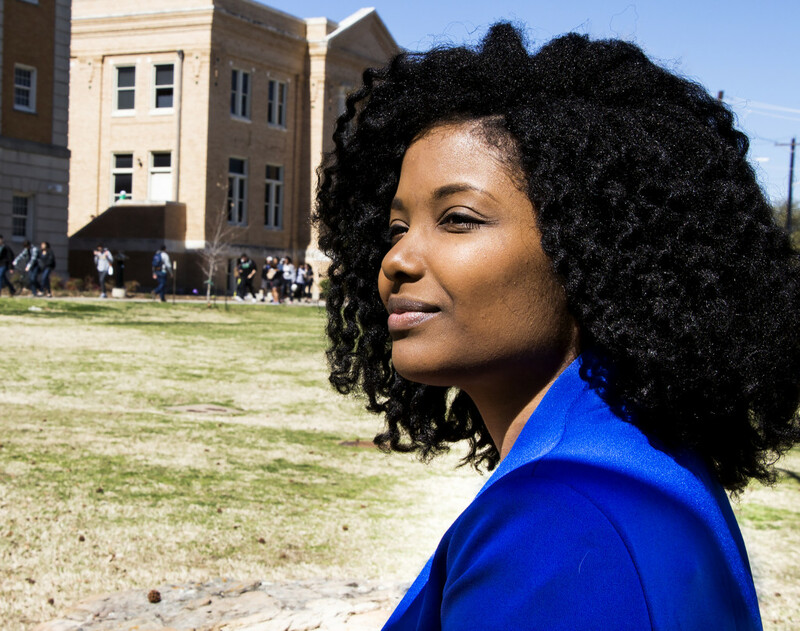 But natural hair isn’t Hardaway’s only focus, as she also educates undergraduate students who find interest in her research and lectures. Fashion design major Sara Bennack said Naptural exposed a more relaxed side of Hardaway—a different persona from her fun but somewhat strict personality in the classroom. Hardaway said she wants to further her education by getting her Ph.D.